I’ve mentioned before that I write articles on HubPages, and at times make and include tutorials for crafts. Since some of these crafts would make great classroom art projects, I’ve set up a gallery for them. If you haven’t made any projects using paper mache clay yet, give it a try. I’ve had so much fun with this stuff, that so far I’ve made turkeys, Santas, snowmen, birds, chickens and a cutie cat that now lives in the school library. You’ll find the Paper Mache Clay Snowmen, Bird and Chick, show at the left, and a bunch more fun project under the HubPages Crafts Projects Gallery in the sidebar. 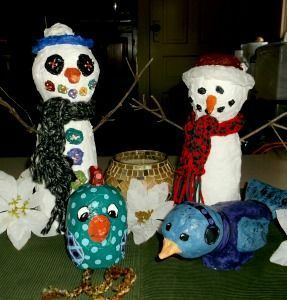 This entry was posted in Categories and tagged arts and crafts, birds, chickens, classroom art, classroom art projects, hubpages crafts, hubpages projects, paper mache, paper mache clay crafts, projects, snowman. Bookmark the permalink.